In late September 1979, Ireland came to a halt for three days when Pope John Paul11 came for a visit. 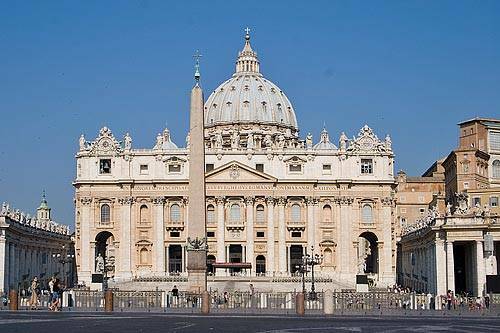 One year later, St. Paul’s, Oughterard, decide to pay him a return call and off we went, 48 of us, to Rome well… it wasn’t quite that simple, but it still is an extraordinary story. 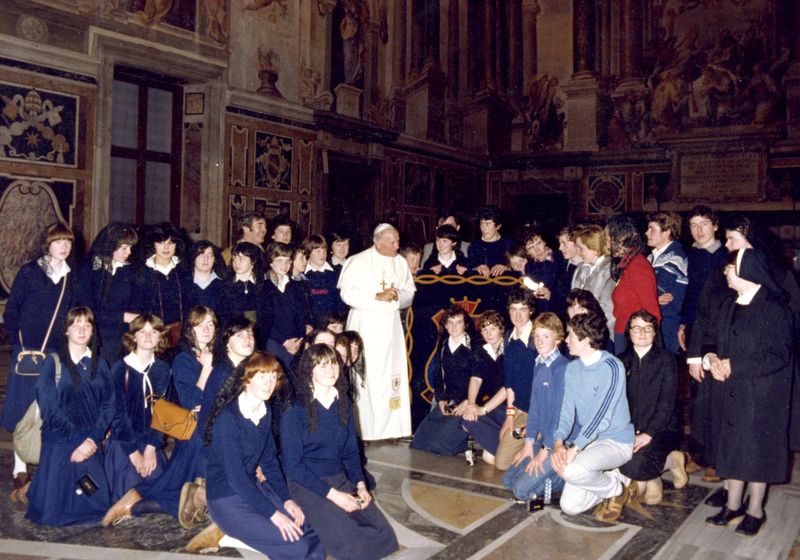 The annual educational trip was a fairly new idea in 1980, and when we proposed a visit to Rome, we found that we needed to include students from junior classes to fill the minimum quota. The date was set for the end of November. 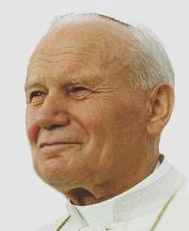 “Oh certainly sister”, I promised, with a confidence I did not feel – but this was a visit to Rome, and I would have instant canonisation to ensure that everything went smoothly. In the few weeks before we went, I got in touch with a few clerical friends but received very little encouragement. Our first chance, I was told, was to get into the Pope’s morning Mass, along with 4,000-5,000 other pilgrims. A private or even a semi-private audience (a group of hundreds, than thousands)? Forget it! That would take months, even years, to arrange. The Pope is a busy man. A group of school kids from the west of Ireland would hardly rank high in his list of VIP’s to be met. I did get one good tip – the Head of the IrishCollege in Rome, who was very friendly with Fr John Magee, (now Bishop of Cloyne) the Papal Camerlengo, or Master of Ceremonies, who was very close to the Holy Father. I also thought I knew him myself, but in fact I was confusing him with his first cousin who had been a student with me. A few days before we left, Sr. Brigid sprang another surprise, which did nothing to calm my nerves. She unveiled a beautiful rug, about 6×3 feet, hand woven in Vsoske’s , which she had commissioned. It was to be our gift to the Pope when we met him. Typically, Vsoske’s had presented it to the school free of charge. It was a beautiful gift, and very appropriate for John Paul. It terrified me. I had visions of mailing it to the Pope from a Post Office in Rome, with a good wishes and a card enclosed. It would go straight to the VaticanMuseum – he might never even see it! At about the same time, Pope John Paul finalised his plan for a formal visit to Germany. He was to leave Rome on Thursday afternoon. We were to arrive on Wednesday evening. In desperation, I phone the Head of the IrishCollege several times, only to be told he was unavailable, or at a conference, or simply not in. An intrigued Irish priest finally asked me what it was all about. I told him I wanted to meet the Pope. “You and a million others,” he said, and laughed. I felt like crying. But when I told this to Sr. Brigid, she amazed me with a magnificent act of blind faith. “Don’t worry Robert, we’ll get to see him.” I wondered did she mean on television! The great day came, and off we went laden with good wishes from the parents of the students. We could not have had a better start, for we had the Aer Lingus flight almost to ourselves – how, I still don’t know. The Chief Stewardess was Mary Geoghegan from Canrawer. We travelled in style! Some students had at least three breakfasts, and there was an endless procession to the cockpit where an extremely obliging Captain showed us everything but how to fly a plane! 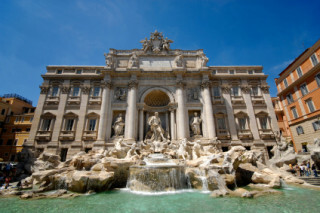 However, when we had landed in Rome and on our bus journey to the Pensione, one of those torrential showers which afflict Mediterranean countries was in full spate. It didn’t deter a few hardy souls from dashing out to fling a few coins in the Fountain of Trevi. The rest of us applauded from the shelter of the coach. He rang off, promising to phone me later after dinner. It was 7p.m on Wednesday evening I ate my dinner, but tasted nothing. The other teachers were as tense as I was. The students were blissfully unconcerned as we sat in the small foyer. Angela O Connor and Henry Keogh guarded the precious rug like trained security men. Then the phone rang. He gave me a series of instructions, where to go, to be there early, what would happen etc. All I could do was to thank him over and over again, until he suddenly said at the end of the conversation, “By the way, do you know what really swung it for you?” John Magee told me it was Galway. As soon as the Holy Father heard the word ‘Galway’ he said, “I must meet these young people! So there you are. “I put down the phone, turned to the expectant faces, I felt like Moses announcing sight of the Promised Land. Raised my hands, beamed at them, and said, “YES”! Tomorrow morning! Private audience! A roar went up in that quiet Pensione that would have done justice to an Irish football crowd. The following morning was like a beautiful spring day in Ireland. Even the elements seemed to want to make the occasion perfect. We arrived at the Porta Portone, two huge bronze doors at the end of one on the semi-circular colonnades which flank St Peter’s Square. 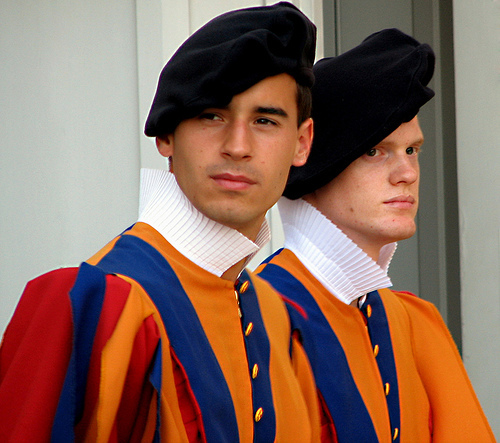 One door was open, and guarded by a tall Swiss guard in colourful medieval garb who stood sideways to any approaching visitor. He held a long-handled shiny battle axe grounded at his side. Unsure of the procedure, the others stood back while I went to speak to the guard. “Scusi, signore”, I said in my bog Italian, and proceeded to explain our mission. To my dismay, he ignored me completely staring fixedly ahead. I saw a large desk inside at which another tall Swiss guard was writing and I decided to try him. “Scusi”, I began again, and took a step forward. Suddenly, the battle-axe whistled down in front of my face, baring my way, and the guard roared, “STOP”! To the rest of the party it looked as if he had beheaded me. The tall guard looked up. I shouted, “Scusi Abbiamo unc”… He smiled and said in perfect English, “Perhaps you’d prefer to explain in English?” He spoke to the guard, the battle-axe was raised, and we all moved inside, into what is the Pope’s official Vatican residence. Five minutes later, down a long marble stairway came Fr. John Magee. He looked at me and said, “You’re not Gerry Watson.” “And you are not the Fr. Magee I know.” “It doesn’t matter,” he laughed. “The Holy Father just wants to meet the young people of Galway.” He led us up through endless magnificent stairways and rooms, past an interior patio that we had seen on the television, and into a huge room which was covered on walls and ceilings with murals to which no photographs can do justice. “This is it”, he said – “The Sala San Clemente. This is where his Holiness will meet you.” In awe at the scale of the room and the incredible paintings, I whispered to him,” I love your interior decorator.” “Oh yes”, he smiled. “He’s a promising young painter called Raphael.” “Of course …I think I heard of him”…. We stood in what seemed a small group in that vast Sala, struck silent by the splendour of our surroundings. I can recall all the details of that audience, but it would take too long to write. He just loved the company of the young people. He was easy and happy moving among them. He asked us to sing his favourite hymn “Our God Reigns” and as we sang, he studied all the faces attentively. He even joined in the singing, but alas he is mortal in that regard! He teased Paddy Joe Mc Donagh of Glann, who was small and angelic-looking then, calling him the “Bambino”. He talked about Ireland and how much he enjoyed his visit. He seemed to have all the time in the world – in fact, the audience lasted almost 40 minutes. He thanked us for the beautiful rug, and in return presented us all with a lovely mother of pearl rosary each. There was an extra one, which he gave to Sr. Brigid. We all felt her prayers deserved it. He gave us his solemn blessing, went off waving through the door, and suddenly it was all over. What happened to the V’soske Joyce Rug? “What will happen to the rug?” I asked Fr. Magee. “Will it go to the museum?” “No” he said. “Surprisingly, he asked for it to be sent to his private apartments.” I felt so gratified by that. The rug had become an obsession with me. Now I could visualise the Pope watching telly in his study with his feet on a V’soske St. Pane’s rug. The next morning we boosted the sales of L’Osservatore Romano’. There we were on the front page of the Vatican Newspaper – three photos of the three groups to visit the Pope before he left for Germany. On top, a delegation of nuclear physicists who were meeting in Rome: at the bottom, a number of African leaders attending a World Development Conference and in the centre, the “Giovanni Irlandesi” from Oughterard, Galway, who were paying a return visit to the Santo Padre! The news had got around when we arrived back in Oughterard late on Saturday night. Quite a few parents were waiting outside the church. In her excitement Caitriona Finnerty dropped the large flask of Chianti which she had carried carefully from Rome and it exploded like a scarlet bomb. We published the abridged story in the ‘Connacht Tribune’. For weeks afterwards we were plagued by phone calls from schools all over Ireland asking how did we do it? We gave them the honest reply – “it’s just a matter of a few phone calls.” Nobody really believed us!